First appearing in 1926, the Gibson L-0 uses a curvaceous, smaller 13.4 inch wide body. Initially made with Spruce top and Birch back and sides, in 1928 it became all Mahogany until 1933, when production ended. They were built again from 1937 to 1942, but with Spruce for the top again and Mahogany back, sides and neck. On all of them, the fingerboards are Rosewood, which at the time meant Brazilian Rosewood. These are very lightly built and responsive guitars. This one weighs just over 3 pounds! Only light or extra light strings can be used. This Gibson L-0 was built during 1928 at the Gibson shop in Kalamazoo, Michigan. and is in original condition. It is made mostly from Mahogany, for the top, sides, back, and neck, and Spruce for the braces. The fingerboard and bridge are Brazilian Rosewood. The top and back are bound with pale Celluloid, and the screwed-on pickguard is a faux tortoise The bridge uses a belly design and features an extra pin in the center, distinctive to 1928. The tuning gears are original. The headstock features a painted The Gibson script logo. A Fibre (cardboard) case is included. There is a fair amount of fingerboard wear in the low positions and high strings. The action is fairly high, though it is playable. If it were to be played regularly, a neck reset would be beneficial. There is a fair amount of finish wear, but expected for its age. These guitars are very lightly built and lightly finished with nitrocellulose lacquer. Many of the Gibson L-0 models, including this one, used a modified ‘H-Bracing’ pattern. Many Nick Lucas Specials also used this system. H-Bracing seems to have been a transitional design between Ladder and X bracing. Ladder Bracing uses simple horizontal braces and is much cheaper to build; many budget or mass produced guitars up to the 1940’s used this design. As it does not stiffen the top as much as X bracing, it tends to deliver less volume and a less defined tone. X Bracing really took over as guitarists needed more volume and heavier strings, and is now almost universally used on steel string guitars. 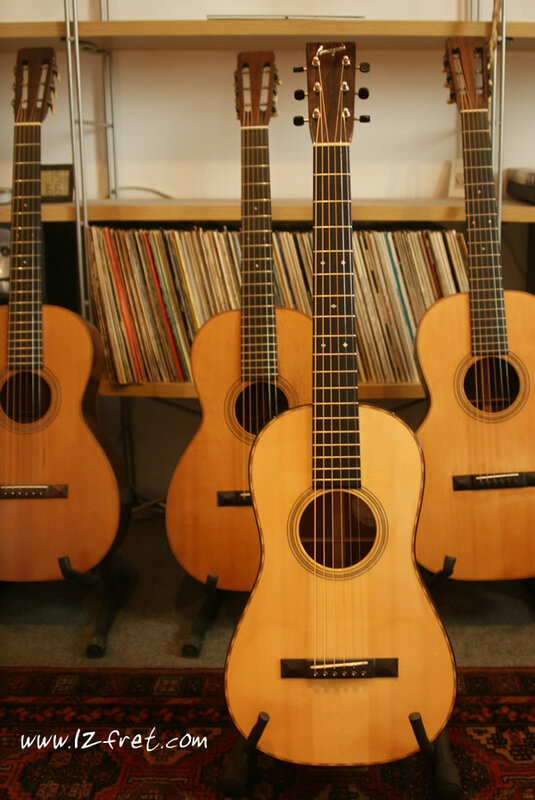 Classical guitars generally use a Fan bracing pattern, though some higher end models use a more complex Lattice pattern.